It was one of the objectives of this trip to South America to find out more about the "second highest" mountains of the Andes. 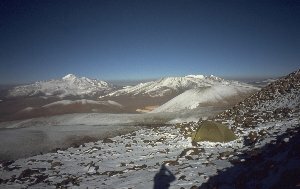 While Aconcagua with 6960 m clearly has the first rank, there is a many-year dispute about which mountain is the second highest. For quite some time, Ojos del Salado had this position with 6893 m, but according to the UIAA expedition commission a recent survey in 1995 is said to have put Monte Pissis (6882 m) to the second rank, and Ojos del Salado would be only 6879 m. On Argentine maps, we find Ojos del Salado with only 6864 m. Cerro Bonete Chico, about 35 km south of Monte Pissis, is the third competitor for the second rank. We find altitudes between 6759 m and 6872 m for Bonete. In order to be sure to have climbed the second highest mountain of the continent, it would be best to visit all three. This was our objective, and we planned to at least do some basic check of the plausility of the surveys on each of the three summits by GPS. 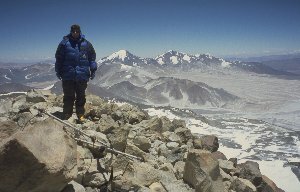 Due to the instable weather we only reached one summit, but the GPS result on Ojos del Salado (reading 6893 to 6896 m, in accordance to the results of other groups on different dates) clearly argue against the quality of the claimed new survey. 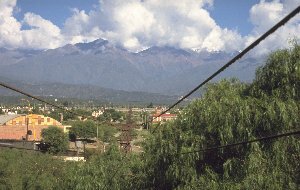 Despite these statistical arguments, Monte Pissis and Cerro Bonete Chico are very rarely visited mountains about which hardly information is found. 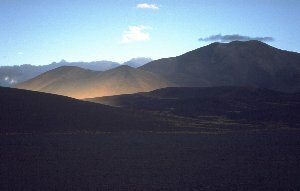 The remoteness especially of Bonete is a unique experience for those who like such dry and vast landscapes. Just for this, such a trip is worthwile anyway. The flight from Frankfurt via Madrid and Buenos Aires to Córdoba takes 21 hours in total. Until Córdoba the flight is "international" which irritated us in Buenos Aires quite a bit (there were no signs indicating flight destinations at the airport Ezeiza). Having passed the time-consuming immigration procedure, we go to the city by bus and take the first hotel we see in the neighborhood of the bus terminal. The bus ticket to Chilecito is purchased in the bus terminal without any long search, everything is well organized. For a city of 1.2 million inhabitants, the center of Córdoba is pretty dead on Saturday afternoon. Most shops close at 2 pm but don't reopen after the Siesta on Saturdays. The restaurant density around the mall in the center is almost zero. After some search we find a restaurant where we can get dinner as early as 8 pm. In order to get used to Argentine food we have Sandwich and Milanesa1. The hotel was rather loud, the only available room had the window towards the street. Since in Argentina people usually have dinner at 10 or 11 pm, the city is rather loud until 2 am, but then suddenly it becomes quiet. Breakfast in the café in the bus terminal. After all cookie, chocolate and whatever salespeople have made their round through the departing buses, we leave for Chilecito well in time at 12:32. After 30 kilometers the first hills are growing out of the plains, densely forested. And - restaurants, restaurants with no end in sight. This seems to be the excursion and holiday area. The journey becomes lengthy, the bus often stops and picks up new passengers. 160 kilometers from Córdoba, the scenery becomes dry, the forest changes to a kind of dry bush vegetation. Having passed a vast plain without any change, later again mountains come into sight. But it takes another two hours until we arrive in Chilecito, after a total of eight hours and 560 kilometers. A travel agency distributes brochures in the bus terminal; they can inform us about a hotel and give us a lift to the "center". That saves us the time for searching. In the evening again we find a restaurant where we are not the only guests at such an early time as 9:30. In Mendoza (1997) that would hardly have been possible. In the night there was quite a thunderstorm, the morning is partly cloudy. A pity, so we don't see much of the Sierra de Famatina. This morning we are looking around Chilecito, getting some (mountaineering and other) information. The cable car of 1904 is surely worth a visit, although it is out of order since 1935 and looks a little run down meantime. It had been constructed by an engineer from Leipzig, Germany, and transported ore and workers between Chilecito (1050 m) and the mine La Mejicana (4600 m) in 8 single courses over a total length of 39 km. Our travel guide about Argentina is a little outdated, unfortunately there is no more direct bus connection from Chilecito northwards to Tinogasta. So we have to modify our plans: Instead of the order acclimatization - Pissis - Ojos del Salado - Bonete it makes more sense to tackle Bonete as the first big mountain, since the trailhead is southwest of Chilecito, while the other two mountains are preferably accessed from northeast. As an acclimatization trip we are thinking about the Sierra de Famatina, maybe trying to go towards the summit of Cerro General Belgrano (6250 m) from the final station of the cable car at 4600 m which is nowadays accessible by road also. This would be a two or three day trip. But the scheduled dates offered by the (only) travel agency here would cost us too many rest days, so we cancel the acclimatization in Sierra de Famatina and directly go for Bonete Chico. We will then see about the acclimatization tactics when we will have clarified the logistics. Changing money is not very easy in Chilecito. The Argentine National Bank doesn't change foreign currency at all, and as we arrive at another bank it is a little after 12:30 and therefore it is already closed. So, mañana - because to simplify matters, the banks don't open at all in the afternoon. Searching for an exchange booth we end up at the tourist information where a very helpful lady delightedly can practise her German 2, but finally she must refer us to the banks or maybe the travel agency. The range of items in the supermarket lacks several things which had been available in Chile without any problems, e.g. mashed potatoes with milk. And, there is only low-calorie mayonnaise, what might me useful for the health of the nation, but is rather unpractical for a several day long mountain trip. We are picked up at the hotel at six in the morning. 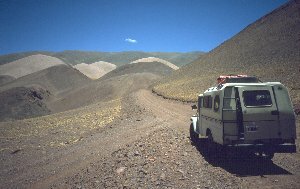 We are joining an excursion to Laguna Brava in order to reach the south side of Cerro Bonete Chico. The route leads around the southern end of Siera de Famatina through a valley where nuts are being grown. But soon there are only cactuses and thornbushes. We cross the pass Cuesta de Miranda and reach Villa Unión (km 105) and from there continue via Villa Castelli and Vinchina to Jagüe (km 220). Irrigation makes it possible to grow some crops, but in between it is very dry. The area is very sparsely inhabited, the three villages are the only ones along the road. 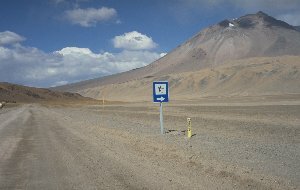 The last 67 kilometers to Laguna Brava at 4300 m are long and winding. We arrive there at 2 pm. Vegetation is very meager, finally at the Laguna there are no plants at all. In a small bay where the salt allows some water to reach the surface, a large group of flamingos is standing. On the drive back we leave the car at Refugio del Peñón (3600 m). 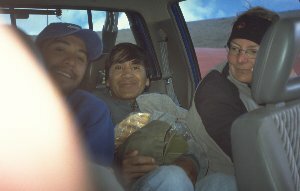 On the way we had met only one car, but its driver, Alejandro, agreed to bring us to the base of Cerro Bonete Chico in two days. The agency in Chilecito does not drive so far north. We will stay at 3600 m for two nights for acclimatization and will be picked up where on the day after tomorrow. It is a nice area for a "holiday": Gras is growing, there is even a source of running water, birds are chirping and there are half-wild cows and some hundred meters further down a herd of guanacos3. We also have another neighbour: A tiny mouse is nibbling at our facturas 4 which we had left lying on the floor at the hut wall. Underneath our campsite some rodents with the name "ururucu" are living, attracting our attention by loud but hardly localisable noise. We could never see any of them. 3 Guanacos and vicuñas are the two wild llama species (out of four in total). Guanacos have a dark face area, vicuñas a lighter one. We spend the morning in the tent or nearby, the weather is not too good. In the night we could see violent thunderstorms further to the south, the morning at Refugio del Peñón is cloudy with some drops of rain. In the afternoon we climb the mountain south of the hut (4214 m). 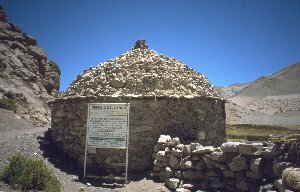 The excursions from Laguna Brava arrive at the hut not until 5 pm, the thunderstorm had made the river crossings difficult. A beautiful morning, cloudless and calm. On time at 10 am our driver comes. Like the day before yesterday we visit the flamingos, then drive around Laguna Brava at its right side to Refugio Veladero. There we leave the road and go through a barren, but very impressive high plain until the sand begins to be too deep for the car. 4750 m, this will be our base camp for Cerro Bonete Chico. In exactly one week the car will come back to fetch us. Considering the altitude, the day is comfortably warm. We can walk barefoot along our "sandy beach". Water is far away, however: down the valley it is at least 40 kilometers to go. But from camp 1 on maybe we will be able to melt some snow, and we rought abouit 20 liters of water and beverages. The afternoon becomes a bit cloudy, the wind freshens up, and again there are some drops of rain. In the evening we have some more fierce snow and sleet showers, but nothing settles on the ground. The morning is nice again and not too cold for the altitude (-6°C). But the lemonade decides to spontaneously transform into a block of ice on opening the bottle. 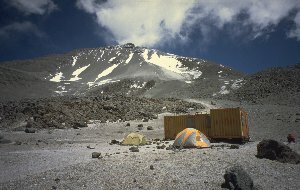 Today, we will bring a first load to camp 1 for acclimatization, returning to base camp afterwards. At first glance that seems harmless, but the vastness of the landscape is new to us and we have to get used to the distances. An endless climb on almost level scree plains, until after 3 kilometers (and 2 hours) we at least can see the mountain again (it was hidden by some hill since base camp). Another 3 km to our scheduled camp site at 5500 m. At least, in a small valley at 5100 m we find a tiny brook of reasonably water - a nice surprise. 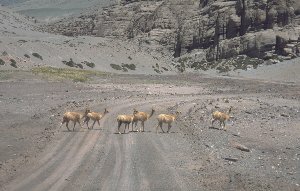 Further above a herd of vicuñas is grazing at some tiny plants. 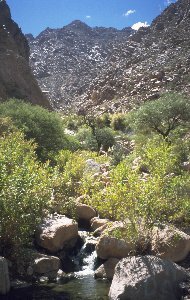 Soon after, a little valley reveals a real brook where even flowers are blossoming. The brook is feeded by penitent snow fields above, these seem not to melt away even in summer. In summary, the area four hours above base camp is much more comfortable than down around base camp. Therefore we go only until 5290 m, the running water here in camp 1 will save us a lot of time and fuel compared to melting snow. 2 1/4 hours for the way back to base camp. The weather is sunny all the day; in the afternoon a partially stormy wind comes up. Despite the heavy load (tent, sleeping bag) it takes 3 1/2 hours to camp 1. The flowers there are nice to look at but their smell is obviously not made for us: it somehow reminds of rotting meat. As a compensation for having had no thunderstorm at all yesterday, today it comes already at half past two. It circles round several times just when Claudia has gone another 200 meters higher to deposit some load there. Fortunately she encounters are only some St Elmo's fires on the way back. In the evening the snow begins to settle. The weather doesn't look too bad. Maybe yesterday's snowfall marks the end of some bad weather period. However, further out in the plains we still see some deep clouds. First part of the way to camp 2 is as boring as all the way we did yesterday. At 5600 m eventually the route steeply climbs up. Already at 11 am the clouds have gathered to full fighing strength. As we eave the steep section at half past twelve, the thunderstorm breaks. There is no time to look for a good campsite; camp 2 is installed at the first level ground that we find, at 5820 m. All the afternoon and evening there is sleet and snow. leave very early, about 2 am. Then we could reach the summit before the thunderstorms begin, but we had to go most of the way in the dark. as the last days, leave when the sun hits the tent, and hope that there is no thunderstorm. Schedules 1 and 2 are not possible today because we are not very well acclimatized and need the sleep in this first night in camp 2. But as we see the good weather in the morning at half past eight and feel quite well considering the altitude, we spontaneously to go for schedule 3. Unlike all the previous days there are no clouds at all. Who knows how it might look tomorrow, and for staying longer than tomorrow our food would suffice only with a real extreme diet. We leave at 9:30 with a minimum of equipment but of course some clothes also for cold weather. Soon it becomes hot, very hot. The scree, however, is still covered by the snow of the last days. 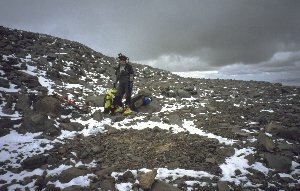 Only 10 to 20 cm, but it makes our progress slow on the slippery scree. We soon realize that we gain only 100 height meter per hour, and in the higher altitude this will surely not become faster. After two hours we abandon our summit attempt at 6035 m. So we have enough time to go down to base camp today and maybe try a different mountain. Meanwhile it doesn't look as if the thunderstorm wouldn't take place today: Like from nowhere clouds have grown all over the scene, Cerro Veladero across the valley as already almost completely hidden. During the four hours descent to base camp the weather takes the usual course - snow, sleet, storm. We would not have reached the summit today anyway, at the latest at about 6400 m we would have been forced to turn back because of the weather. The morning is - as usual - cloudless. Before we take our tent again in order to install a high camp in the Sierra del Veladero we decide to observe the weather for some time. After the strenuous last days, we decide to leave the tent in the base camp and only undertake a short trip to the mountain immediately west of us. That is only a hill (5233 m) which we easily reach after 2 1/4 hours, but it offers a very good view. Eventually we also believe to clearly identify Monte Pissis. Around the Caldera del Inca5 which is not visible, between Bonete and Pissis there is quite a lot of high and snowy things which make orientation a little difficult. The GPS seems not to be reliable today. Despite apparently good horizontal accuracy (9 m) our track shows jumps of 200 meters sideways, and on the summit the altitude reading is jumping between 5300 and 5800(!) m.
On the way back we take a closer look at the many big boulders in the plain. All these rocks, up to five meters big, obviously had been thrown to here over several kilometers by volcanic eruptions. Fortunately, that was quite some years ago. Today is the first day since our arrival without any thunderstorm. But through all the day it is quite windy. This might have been a better summit day than yesterday, but who could have known that in advance. And we also don't know if staying at about 6000 m for several days would have been a good thing with our current state of accliatisation. 5 The Caldera del Inca Pillo is a volcanic crater lake between Cerro Bonete Chico and Monte Pissis at about 5500 m. The lake has a diameter of 5 kilometers and therefore is one of the highest "real" lakes in the world. Unfortunately it is rarely visited because the access through the long sand-filled valleys is difficult. In the night there were thunderstorm in the south, we saw a lot of sheet lightning. In the morning we see huge clouds there, but at our base camp it is sunny. We explore the valley up towards the north a little bit. The apparently last lava stream from Caldera del Inca shaped a bizarre landscape there. Bizarre also: When walking on the dry and frozen river bad, suddenly the river is coming towards me from above. First only a little rivulet, then in waves more and more water comes. The river seems to thaw from above. But the water flows down only two more kilometers until it disappears in the plain "Campo de los Burritos Muertos" - "field of the dead little donkeys". Also today there is no thunderstorm. Apparently we arrived exactly in a bad weather period with our schedule. The question is if there are typical durations of good and bad weathers which one can more or less rely on. Today is wating-for-the-taxi day. Soon all our equipment is packed in the morning, and we are sitting in the desert waiting for the car which should fetch us at 1 pm. Indeed the car comes, more than early, at 11:30. The weather is perfect for a sightseeing trip. 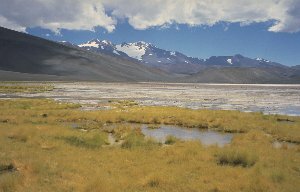 We go from the desert of our base camp passing by the salt lake Laguna Brava, down to the "vegetation zone" where lots of vicuñas are grazing and wallowing in the sand. Further down the land becomes hot and dry again, nevertheless an interesting landscape. After 95 kilometers we enter the first village Jagüe, and from there only 115 kilometers to go to Villa Unión. The latter one is a somewhat sleepy little village, but it has a good tourist information which even distributes a "city map" (and which seems quite competent anyway). Villa Unión is situated at an altitude of 1470 m; yesterday afternoon was very hot, but this morning it is cloudy with pleasant outside temperatures. Conspiciously, an unusual amount of people in the "city" are on the road on bicycle. In Chilecito we had hardly seen any bicycle. A reason might be that Villa Unión is quite small and isolated. Who lives here, normally has no long ways to go. We get the last two seats in the 3pm bus to La Rioja as we look for tickets at 11 am at the bus terminal. In the evening we arrive in the province capital La Rioja. There is even a direct bus to Fiambalá next morning, but it leaves at 5 am. And if there are free seats will be known not before 10 pm because it is a night bus from Córdoba. The bus terminal is quite a distance away from the center where we (with some effort) find a hotel - fortunately with air conditioning. For diner we go back to the bus terminal to see about the seats in the night bus. The night bus was booked out, so we have to first go from La Rioja to Aimogasta and then get a connection to Fiambalá bekommen. Since the routes are operated by different companies one has to get the tickets on the spot. Aimogasta is situated about 120 kilometers north of La Rioja, and it is the first village with more than three houses since there. Aimogasta is about what one would characterize as "middle of nowhere". Surrounded by steppe and cactuses there is a large olive cultivation. We can look at this completely uninteresting landscape not only 2 1/2 but 5 full hours because our connection bus is delayed. So we arrive in Fiambalá around 10 pm; it is too late to buy some food and supplies for the mountain after we have found accomodation and have organized the program for the next mountain, Ojos del Salado, with the local agency. For diner, it is never too late in Argentina. We have diner at the Plaza, and we have the doubtful pleasure to see tuned cars with undercar illumination which drive around the plaza only for show. So each village is a new experience here - in Villa Unión it would have hardly been more than tuned bicycles. But everywhere the little children are romping on the playgrounds until far after midnight. After the long siesta in the afternoon they are awake even late in the evening (seen on a European scale). The kiosk is open on Sunday and today makes the business of its life with lemonade for our five day excursion. Also the panaderia is open so we also are well stocked with bread again. The car is ready at noon; since the boss had been on the way with clients until 11 pm yesterday, his son will do the trip today. Apparently he hasn't spent too much time in bed, however. Until Paso de San Francisco (4750 m) we drive 200 kilometers through desolate but interesting landscapes. So, for 10 kilometers all the mountains are glowing red, probably due to iron. Further up, desert-like high valleys alternate with a little puna grass. 21 kilometers before the pass is the Argentine customs station Las Grutas where a half hour long forms and stamps action takes place. 20 kilometers behind the pass follows the Chilean carabineros station at Laguna Verde, and the confusion begins. One carabinero says it would be sufficient to deposit passports and permit because we do not really cross the customs border. But finally the other carabinero's opinion prevails, sending us from the carabineros station (kilometer marker 270) to the customs clearance at Maricunga (km 170) and then back to the junction at Ojos del Salado (km 250). During this trip our driver is sometimes overcome by sleep, so we swap the steering wheel for several kilometers. In Maricunga we officially enter Chile. There is a huge customs building; on the seldom approach of a vehicle, the three officers here (customs, carabinero and SAG) "come to work" by bicycle and for a short time inhabit the almost empty building. One easily can see ten minutes before when a car is coming. On the way back towards Laguna Verde we again meet the carabineros from there; they take our passports and the permit so we could possibly get these back in five days without the detour via the customs control. We will see. The track from the international road to Refugio Rojas (5260 m) is very sandy and takes a lot of time. Also the radiator needs special attention and refill. At 7 pm we arrive at the refugio. There are quite some people, already eight or nine tents are pitched. For our tent there is still one wind shelter left. As we finished packing in the morning, the camp guard comes by and wants to charge a US$160 per person entrance fee. We knew before (also from the DIFROL permit) that there was a charge, but the outrageous amount was given neither in the permit nor on the website of the company that demands the fee. Under protest we pay and such contribute to the golden bathtub of Aventurismo Expediciones (details see "practical hints"). The 600 height meters to the upper refuge take about four hours. That is not too slow, since we have all our stuff for the night and a lot of beverages with us. At Refugio Tejos (5830 m), almost nothing has changed in the last 12 years. Obviously the 160 dollar entrance fee also didn't make it possible to put a toilet to Refugio Tejos to avoid people using all the area to do their "business". In the afternoon a couple of people come down from the summit, most of them between 4 and 6 pm. We will see how things will go for us tomorrow. After a more or less comfortable night (just as one can expect at almost 6000 m), we leave at 4:45. It is pitch dark, but we find our route without major problems, even though we don't follow the normal route: Since we don't have our crampons with us, we must avoid the glacier traverse of the normal route on the right side. Further up on the ridge, small loose scree makes our progress strenuous; also on the trace which we join at 6600 m walking is quite tiring. Around noon we eventually reach the crater 6. The highest rock bastions across the crater which have not yet been completely removed by erosion are the two summits, Chilean and Argentine. 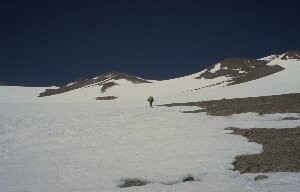 Both are the same height down to the last meter, and of course we climb the Chilean summit. Anything else would have been illegal border crossing, of course. In the couloir between the two summits and at the ridge towards the Chilean summit we find 15 meters of fixed ropes which would not be necessary - if this would not be a high 6000 m peak. But here, where everybody is at some limit of power and concentration due to the thin air, it is not a bad idea to use this rope and be happy that it is there. The rock is very good and solid, not too difficult (II), the ridge is easy walking terrain again. At half past one we reach the summit. The weather is perfect, and the cold wind that annoyed us during all the morning has completely disappeared up here. We can enjoy the view around of much sand and snow. The GPS shows heights between 6893 and 6896 m; the recent survey of 6864 m claimed by Argentina looks questionnable seeing these data. After a slow and careful (because of the loose scree) ascent we reach Refugio Tejos again at 5 pm, enter our tent and simply do nothing for two hours. 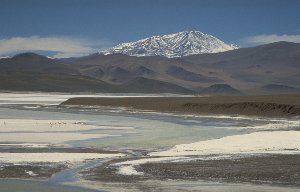 6 Ojos del Salado is the world's highest volcano, but it is inactive since quite some time and the crater is partly eroded. But in the summit area, volcanic gases can be noticed. The way down to Refugio Rojas takes only one hour. Nevertheless it probably was better to stay the night at Refugio Tejos rather than fighting down with the heavy load in the evening, already being exhausted from the long day. We have enough time, and the second night up there shouldn't be a disadvantage for our acclimatization. The car will come tomorrow morning, there is no reason for a hurry. Well in time at 10 am we are ready with packing our stuff. But no car in view. After nothing happens for three hours we can join the last remaining car here - the car of Walter and Gunther, who had been on the summit yesterday - to go down towards the road. After a 15 minutes drive we meet our transport service who apparently yet again has some radiator problems in the high altitude. We reload the gear at Laguna Verde. Now part 2 of the odyssey begins. Our passports are in the carabineros station five kilometers west of here. From there it would just be 20 kilometers to the border. Of course it is not that simple. After we fetched our passports we have to drive 90 kilometers into the country in order to leave the country. In the customs station Maricunga we get the passports stamped, and go back to the carabineros station. There the first question is "where is the yellow carbon copy?" The carbon copy of the light blue form. The customs officer obviously has forgotten to fill this form. But without it, the Argentine customs would not let us in. After a lot of discussing back and forth, the carabineros let us go on, willing to clarify things by radio with the Argentine colleagues, if necessary. Since the Argentine officers do not ask for any form, neither yellow nor light blue, we will never know about the real meaning of the yellow copy of the light blue form. Furtunately the remaining 200 kilometers to Fiambalá are paved; our driver does the first half, then better I take over. At nine o'lock the odyssey is over. In the morning, the people of Fiambalá remove the heaps of mud which were left on the streets by the violent thunderstorms of the last days. After we have registered for Monte Pissis at the tourist information and at the carabineros station, and after purchasing the bus ticket for Córdoba for next Thursday, we leave the town at noon. Two Argentines join us, they want to do some trekking around Monte Pissis base camp. After one hour on the good paved road to Paso San Francisco we turn off and use a small, sometimes rather bad dirt road that crosses several passes and leads to Laguna Verde7 in a complicated way. Several stops due to boiling water in the radiator are included. In the plain south of the Laguna, finally there is no chance to restart the car after the water is refilled. The battery is empty, right in the middle of the desert. After two hours back and forth, it is clear to everybody that one cannot get a heavy pickup started by pushing in the sand plain. We cannot expect any help today - we are the only ones using this road today. While driver and one passenger are preparing for an unpleasant night in the car, the other passenger, Claudia and I begin the walk of the eight remaining kilometers to Monte Pissis base camp. There they have a radio. The alleged 8 kilometers become 13.6, and the evening walk becomes a four hour trip through the dark. We are quite happy as we eventually reach the big tent at about 10 pm. 7 a different Laguna Verde than that one in Chile at Ojos del Salado. At 9:30 in the morning our car is coming together with another pickup which had departed in Fiamblá at five in the morning and had given a jump start down in the plain. After the previous inhabitants of the base camp tent, who had climbed the summit yesterday, have left, we sort our equipment and leave for camp 1 around 10:30. The way is very tiring: It follows a long and monotonous dry valley with very irregular scree surface. 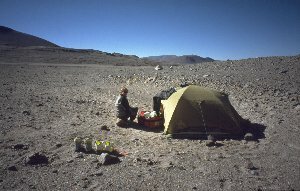 After that follows an endless crossing of flat scree slopes, and after six hours we reach the camp site (5363 m). There is abundant running water from the glacier, and the weather is good. From camp 1 nach camp 2, at least the distance is not very long. We go on the right side of the snowfield in increasing steepness. 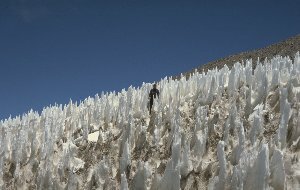 At the given altitude of 5900 m, however, we find no camp possibilities - we are in the middle of a steep snow field, and the following 200 height meters wouldn't be less steep. After some search we find a level place very far at the right side. There are no signs of a campsite, and there is no wind protection. The bad weather front which had built up behind us during the last hours suddenly encircles us from the front. 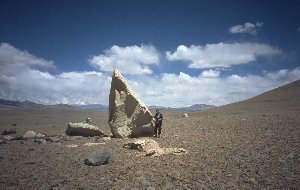 Behind a big stone at 5930 m we can arrange a more or less acceptable tent site. From 3 pm on, it is snowing until night. We had planned to go for the summit at 4 in the morning. It is not snowing but still partly cloudy, and the stars have a strange mikly appearance. Doesn't look convincing, we stay in the sleeping bags. In the morning snowfall sets in again, not stopping before evening. 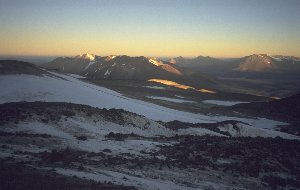 Our last opportunity to reach the summit will be next night around 4 am: Then we could - after an extimated 9 hours ascent, 3 hours way back and 4 hours descent - reach the base cam in the evening and could be fetched by the car as scheduled on Wednesday. At 3 am the weather is good. At 3:45, we begin our way on the traverse towards the glacier. There are 20 cm of fresh snow. Although we are walking and moving, our hands and feet become colder and colder. After twenty minutes we decide to turn back. Back at the tent, the thermometer shows -22°C. We are not equipped too bad, but for nine hours through deep snow at such temperatures above 6000 m altitude, our shoes might not be warm enough. So we begin the descent without the summit. Maybe even struggling through the night wouldn't have been worthwile, since soon clouds come up and hide first the view to the distance, then also the higher summits of Monte Pissis. After an hour we are at the altitude of camp 1 where there is almost no more snow. Now another two hours exreme-stumbling. We use the other valley today, but that doesn't make any difference. Only bigger and smaller scree, we do not found any walking rhythm. But there is an end of all the effort, the red base camp tent. The two Argentines are already waiting for us. Finally again a night on a real mattress. In the base camp tent (a barrel shaped tent) it is colder than in our small tent, but still we slept very well. In the morning we packed everything, and at 10 o'clock indeed a car is coming. It is not Cristian R., but his breakdown helper from Saturday. This has the advantage that his car has neither a radiator nor battery damage and we have to stop only for sightseeing. On the way back we can see flamingos at Laguna Verde, but also without a lot of photo stops, the 90 kilometers on the very poor road take a lot of time. On the paved road of Paso San Francisco another 86 km to be done, but we could have finished them faster: The driver has a preference for neutral gear which produces only a very moderate speed on a road with a gradient of only 2%. After six hours drive - in the end through intense rain - we are in Fiambalá. Today many foreigners are in town. The three Swedes Janne, Nadine and Erik, and another German. The Swedes are planning to go to the Argentine side of Ojos del Salado. In the evening there is an excellent asado8 with very good local wine at Reynoso's. 8 grilled meat. Grilling is a cult in Argentina. Basically, Argentines are always busy grilling. After a short breakast on the plaza ( the weather is good again) we go to the Termas de Fiambalá by taxi. This is comparably expensive (because the Termas are 17 km distant) but really worthwile. We relax in warm to hot water in natural stone basins in the shadow of the trees. At 7 pm goes the bus from Fiambalá to Córdoba, we arrive there next morning at 7:30. After a visit of the tourist information counter in the bus terminal we quickly find a hotel nearby. The rest of the day is spent with an extensive siesta, since we didn't catch much sleep in the bus last night, and it is very hot here around noon (35°C). In the evening we visit a self-service parillada restaurant that had been recommended to us by the two trekkers in Pissis base camp. Not too many activities except for the guided city tour. A lengthy siesta. We spend the morning in Parque Sarmiento watching more or less successful joggers. Already the morning is quite warm. Around noon we take the regular bus towards the airport and fly from there to Buenos Aires - Aeroparque Jorge Newberry, which is situated directly at Rio de la Plata which here is more a bay than a river. Since 1997 the autopistas apparently have been completed, so the taxi brings us to the international airport Ezeiza in half an hour without an extra city tour (which is a pity, somehow). On Monday evening we are back in wintery Germany.